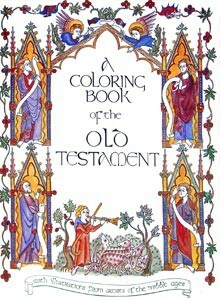 A Coloring Book of the Old Testament. From manuscripts mainly of the 13th and 14th centuries. The scenes from the Tickhill & other Psalters make this a veritable course in medieval art history. Students will delight in this beautifully detailed coloring book produced by Bellerophon. Each page is titled and some have scripture references. All ages. Approx. 25 pages. A Coloring Book of the Old Testament. From manuscripts mainly of the 13th and 14th centuries. The scenes from the Tickhill & other Psalters make this a veritable course in medieval art history. Students will delight in this beautifully detailed coloring book produced by Bellerophon. Each page is titled and some have scripture references. All ages. Approx. 25 pages.